The mobile mapping market is poised for remarkable growth, thanks to breakthroughs in LiDAR technology, a host of new applications, and the economics of the business – so said Erich Smidt, European Sales Director for Velodyne LiDAR, during a keynote presentation at “Capturing Reality,” the 3D, Laser Scanning & LiDAR Technologies Forum, held in late November in Salzburg, Austria. The takeaway? According to Smidt, “implementations that can do more, across a greater number of market segments, for far less money.” Backing up that conclusion were a half-dozen companies and applications deploying Velodyne’s multi-channel, real-time 3D LiDAR sensors – the 32-channel HDL-32E and the lighter, more compact VLP-16 LiDAR Puck -- for various mapping applications. Capturing Reality focused on the use of laser scanning, 3D imaging and LiDAR to support infrastructure development, BIM, transport, urban and coastal zone mapping, asset management, 3D visualization and GIS applications. More than 400 delegates from 35 countries gathered to hear 46 presentations delivered by leading experts. Attendees also visited the accompanying exhibition of more than 40 hardware/software manufacturers and service providers. In addition, a series of live demonstrations and technical workshops provided a very busy three-day schedule. Among the hottest emerging areas within mobile mapping, according to Smidt, are implementations without GPS/IMU that use SLAM (simultaneous localization and mapping) algorithms, thereby reducing payload weight and extending flight times. These SLAM algorithms are especially important for indoor mobile mapping solutions, with sensors on backpacks and push carts creating 3D maps of interior real estate and other BIM applications within minutes after scanning. Routescene, based in the U.K., presented its LidarPod supporting both the HDL-32E and the VLP-16 as options in a highly compact, sleek, carbon-fiber design. Combined with Routescene’s LidarViewer, raw data can quickly be turned into usable GIS information. Routescene solutions are available in the automotive, marine, rail and UAV markets. Topcon presented its second-generation mobile mapping solution, migrating from the IP-S2 with Velodyne’s HDL-64E to the much more compact IP-S3 using the HDL-32E. 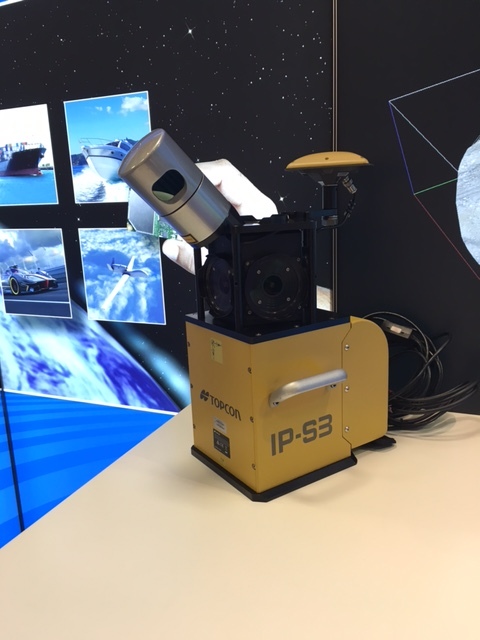 The IP-S3 obtains high-quality measurements with detailed shapes of objects based on 5MP 360° cameras and 700,000 data points per second from the HDL-32E. An instant preview of the acquired data is available immediately upon completion of a data collection session. Backpack-based surveying. Velodyne’s compact VLP-16 LiDAR Puck was an integral part of systems on display by Microsoft and Leica Geosystems. Leica’s backpack sported two of Velodyne’s LiDAR Pucks in order to obtain almost full 360° coverage in horizontal and vertical directions, with remarkable point cloud density. Microsoft emphasized that its UltraCam Panther backpack solution sporting the lightweight VLP-16 can easily be integrated with software packages like Orbit GT (below), resulting in industry-leading workflows and maximum customer benefit. Software provider Orbit GT showed its Everything Mobile Mapping™ portfolio, an end-to-end application that uses Velodyne LiDAR point cloud data to cover production, extraction and sharing/publishing in an integrated and optimized workflow. VIAMETRIS, which develops innovative technologies in mobile 3D scanning and automatic data recognition, presented an indoor mapping trolley system that can incorporate the VLP-16 in an outdoor implementation. VIAMETRIS previously worked on a development involving the Velodyne HDL-32E spread on a car’s roof. Using innovative 6DOF (Degrees of Freedom) SLAM, VIAMETRIS is among the earliest champions, and adopters, of the VLP-16. 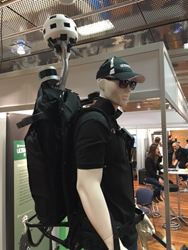 The company’s research team developed a backpack prototype based on a VLP-16 to manage positioning in indoor and outdoor environments. Because the VLP-16 is a 3D sensor, the positioning process is able to calculate a trajectory based on SLAM technology. Founded in 1983 and based in California’s Silicon Valley, Velodyne Acoustics, Inc. is a diversified technology company known worldwide for its high-performance audio equipment and real-time LiDAR sensors. The company’s LiDAR division evolved after founder/inventor David Hall competed in the 2004-05 DARPA Grand Challenge using stereovision technology. Based on his experience during this challenge, Hall recognized the limitations of stereovision and developed the HDL-64 high-resolution LiDAR sensor. Velodyne subsequently released its compact, lightweight HDL 32E sensor, available for many applications including UAVs, and the new VLP-16 LiDAR Puck, a 16-channel real-time LiDAR sensor that is both substantially smaller and dramatically less expensive than previous generation sensors. Market research firm Frost & Sullivan has honored the company and the VLP-16 with its 2015 North American Automotive ADAS (Advanced Driver Assistance System) Sensors Product Leadership Award. Since 2007, Velodyne’s LiDAR division has emerged as the leading developer, manufacturer and supplier of real-time LiDAR sensor technology used in a variety of commercial applications including autonomous vehicles, vehicle safety systems, 3D mobile mapping, 3D aerial mapping and security. For more information, visit http://www.velodynelidar.com. For the latest information on new products and to receive Velodyne’s newsletter, register here. Topcon's second-generation mobile mapping solution incorporates Velodyne's HDL-32E LiDAR sensor.